PORTSMOUTH, NH (May 12, 2009) — While we all love our children, there are indeed times when you seek a vacation resort without kiddie pools, children's clubs, and the high-pitched squeals of the younger set. This exquisite lodge combines every wonderful little luxury with a low-tech approach to relaxation — there are no phones or television to interrupt the mood. What guests do find are 30 thatched-roof bungalows, set on stilts and tucked here and there, mingling with the branches of surrounding tropical foliage. These exceptionally private villas offer palm-framed ocean views, tropics-inspired furnishings, verandas, outdoor showers, king-size beds with gauzy netting, and tempting hammocks slung between shady palms. This AAA Four Diamond luxury resort has long been known as a favorite Hawaiian vacation retreat for generations of travelers seeking a serene and enchanting escape. Here, tranquility is a way of life; the hotel reflects a wonderful blend of Hawaiian heritage and the unspoiled natural beauty that make Hana such a special place. At the decadent spa, guests can enjoy the ultimate in nurturing with massage, facials, and body treatments. Soft-spoken luxury, privacy, and informal elegance are the hallmarks of this resort-style inn in the Napa Valley. Perched on the slope of Rutherford Hill overlooking the valley, the Auberge's French-accented California style and soft-spoken luxury echo the character of Napa - a place to savor the bounty of fine food and wine and immerse oneself in an exquisite natural setting. Since the inn's opening, guests have been drawn to the Auberge for its privacy, tranquility, and romance. This intimate Caribbean hideaway is committed to peace and tranquility and delights guests with its refined, unpretentious atmosphere and relaxed, all-inclusive pricing. Glimmering turquoise seascapes and lush gardens create a soothing, natural setting for those who want to decompress and escape from the world. The boutique hotel's 98 guest rooms are set amid 40 acres of beautiful tropical gardens, providing a distinct sense of privacy. Most accommodations are tucked into the landscape along the beach, so a swim is just a few steps across the sand. Built of Caribbean timbers, local stone, and terracotta tiles, the unique architecture of this resort means that all rooms are "missing" a fourth wall, with no windowpanes or sliding doors to obscure the veiws or dull the natural sounds of the nearby rain forest. Guests can slip into their beautifully landscaped private plunge pool and enjoy the rhythmic trill of the tree frogs. Forget the crowds of Cancun...just across the bay tiny Isla Mujeres is all about local color and serenity. White-sand beaches and warm turquoise water, working fishing boats and low buildings painted pastel hues set the relaxed scene. Tucked away on a spit of land with its back to a lagoon once used by pirates and its face to the Caribbean, Hotel Villa Rolandi keeps its distance even from the island?s single town, treasuring its sense of seclusion and the comfort of its guests. Everything about Casa Velas is meant to celebrate couples, in a seductive setting of private, tranquil pleasures, with nothing to break the calm and quiet atmosphere of tropical beauty that surrounds you. This all-inclusive, adults-only playground is the perfect place to unplug and reconnect - a divine retreat for the mind, body, and soul on Mexico's luscious Gold Coast. Imagine a tropical getaway that offers sublime luxury in a spectacularly exotic locale. This is Gaia. Gaia Hotel achieves an ideal blend of modern amenities and natural scenery. Nestled in the magnificent coastal forests of Costa Rica, the hotel?s well-appointed, terraced suites and villas offer views of lush and pristine wild surroundings that are beyond compare. For unabashed luxury in one of the most beautiful settings of the world, Mystique provides a romantic atmosphere of understated elegance. Guests enjoy an outdoor infinity-edge pool, the ?Aura? Pool Bar, the ?Charisma? Gourmet Restaurant, and the ?Secret? Wine Cave. Slatted wooden decks lead to the plunge pool, surrounded by sun beds for the utmost in relaxation. Looking for an exotic hideaway that exudes a true sense of exclusivity? 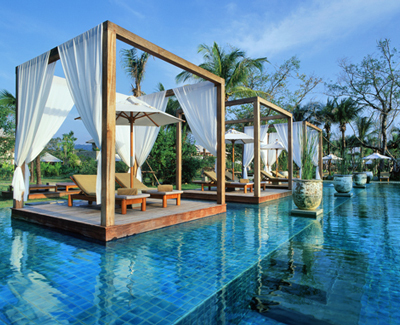 The Sarojin Resort in Khao Lak offers contemporary Asian surroundings with subtle touches of luxury and elegance. Set within 10 acres of beautifully landscaped gardens, the resort features an expansive white sand beach. The 56 guest "residences" are surrounded by walkways, manicured lawns, bright aqua infinity pools, lotus ponds, and two fantastic gourmet restaurants. This is an ideal haven for couples. Hideaways International is a luxury travel company in business for 30 years, catering to savvy, discerning consumers with a passion for travel. Hideaways International operates the Hideaways Aficionado® Club, with members worldwide — ranging from notable celebrities, musicians, publishers, authors, and politicians to ordinary folks with extraordinary taste — all part of this lively community with a passion for luxury travel. For more information on Hideaways international and becoming a member of the Hideaways Aficionado Club, visit: www.Hideaways.com.